Italian soldiers are still dying following exposure to depleted uranium in the wars in Bosnia and Kosovo, their relatives say. Troops who served during the wars in the 1990s believe they have contracted cancer and other serious illnesses from extended exposure to the munitions. 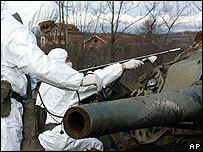 The US says it fired around 40,000 depleted uranium rounds during the Bosnian and Kosovo conflicts. A pressure group says 50 veterans have died and another 200 are seriously ill.
Depleted uranium is used on the tips of bullets and shells. Because of its density it can pierce the armour plating on tanks. But when it explodes it often leaves a footprint of chemically poisonous and radioactive dust. The Italians who served in Bosnia and Kosovo were involved in the clear-up of battlefields and came into close contact with exploded ammunition. The association representing the soldiers, known as Anavafaf, says many of those who have died or are ill have contracted cancer. In 2002 the Italian defence ministry published a report compiled by independent scientists which found a higher than average number of servicemen were suffering from cancer. It said there was an excessive number of Hodgkin's disease victims among Italian Balkan peacekeepers. A number of children fathered by the soldiers have been born with disabilities. There are similar reports from soldiers' associations in Belgium, Spain, Portugal and the Netherlands. Both the US and Britain acknowledge the dust from depleted uranium can be dangerous if inhaled but they insist the danger is short-lived and localised.